This wonderful knife is made by "Kmet"(????? The excellent heat treatment and subtle mixing of the blade makes it very durable and sharp. The total length: 250 mm. The length of the handle: 125 mm. Blade thickness: 3,5 mm. Steel - Bohler M390 (61-62 HRC). Descents straight at 0.3-0.4mm along the cutting edge. Material handle: Stabilized Karelian birch. Installation of a handle: through. 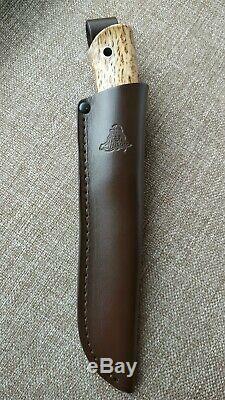 Sheath of high quality leather. 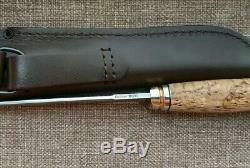 The item "Kmet fixed hunting knife Bohler M390 leather case Handmade in Bark River stle" is in sale since Friday, March 22, 2019. This item is in the category "Collectibles\Knives, Swords & Blades\Collectible Fixed Blade Knives\Modern Fixed Blade\Custom & Handmade". The seller is "seafoxvrn" and is located in Voronezh. This item can be shipped worldwide.